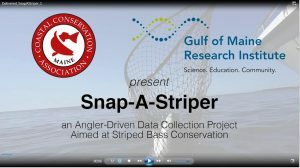 The Coastal Conservation Association-Maine (CCA-Maine) and the Gulf of Maine Research Institute (GMRI) are continuing to collaborate on a data collection program called “Snap-A-Striper,” aimed at compiling photos of live release and legally harvested striped bass caught in Maine waters. Body shape data collected from photos with Snap-A-Striper data cards in place, as well as data from the otoliths (ear bones) of legally harvested fish can help GMRI scientists determine the origin (locally spawned or migratory) of stripers in Maine, information that can improve management of the resource. The striper study is providing scientists a chance to build a better understanding of this iconic species, while working together and fostering stewardship with Maine anglers. We are looking for anglers, guides and captains from Boothbay to Kittery to email photos of stripers with special down-loadable data cards in place (see links below) to the fishery scientists at GMRI. The information developed from your photos could lead to better management of Maine’s striped bass resource. The scientists need all the fish photos you can send. Awarded at season’s end to the angler/captain/guide who submits (monthly)the most photos taken in June, July, August and September combined. Awarded by drawing to a lucky angler/captain/guiide. accompany fish photos submitted by young anglers must include their names and ages. Learn more about how you can get involved by watching the video below and reading the following instructions. The Snap-a-Striper program was recently profiled on Bill Green’s Maine. Watch the television segment here! When a striper of any size is to be released, the photo process is best accomplished with two people working together in a boat. One person plays the fish while the other fills in a data card which can be downloaded here. The fish is photographed with the card in the frame and the fish is released as quickly as possible. The photograph can then be emailed to stripers@gmri.org. A new data card should be used for each fish photo. Please be sure to include the names and ages of young anglers 12 and under in the emails accompanying their fish photos. Wet the deck slightly before bringing the striper aboard. Ensure the whole fish is visible in the frame – stand on a seat if necessary. 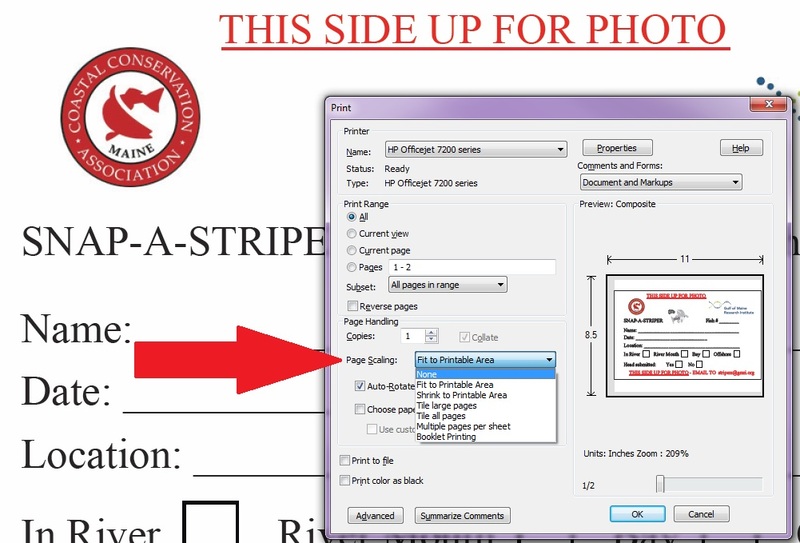 When photographing a striper that will be legally harvested, you will need to put a filled-in data card in the frame. We encourage you to remove the head, freeze it in a plastic bag with the same data card used in the photo and email stripers@gmri.org for pickup or delivery instructions. Whenever possible, GMRI prefers photos of both released and harvested stripers to be taken with filled-in SAS data cards. However, some SAS participants prefer to download a single “master” data card, write in their unique Fish # (example: 10DB16) in the appropriate space, laminate the card and use it in every striper photo they email to GMRI, adding the required catch data requested on the card – angler name, date, catch location and ages of young angers 12 years and under to the photo email. Alternatively, a short ruler clearly marking at least five (5) inches can be used in a striper photo, with the required catch data added when the photo is emailed to GMRI at stripers@gmri.org. Note: if printing your own data cards, be sure to turn off print scaling in your pdf reader. If you continue to have problems, please contact us at ccamaine@gmail.com. We look forward to seeing your striper photos and we thank you for participating in this important “citizen science” research program.